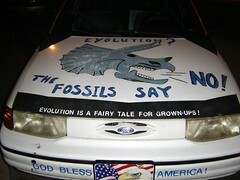 Tweet Share Since at least McLean v. Arkansas in 1981, Creationists – Christian fundamentalists who oppose evolution – have turned, intriguingly, to philosophy of science to try to justify the inclusion of Creationism alongside evolution in science classrooms. Since at least McLean v. Arkansas in 1981, Creationists — Christian fundamentalists who oppose evolution — have turned, intriguingly, to philosophy of science to try to justify the inclusion of Creationism alongside evolution in science classrooms. Looked at historically, though, the turn to philosophy of science for support is not a new move. In the nineteenth century, Creationists and fundamentalists looked to Francis Bacon as their philosopher of choice. But it was a particular use of Bacon, one that applied a rather naive realist sense of evidence and empiricism. In the late twentieth and early twenty-first centuries, it is secular philosophers of science Karl Popper and Thomas Kuhn, opponents in life, who Creationists have turned to in their attempt to make their ideas seem as “scientific” as possible. This use appears particularly ironic given that both Popper and Kuhn — for all their disagreements and disputes — were both concerned with differentiating pseudo-science from science. Put in context, then, it seems perfectly rational and even expected that believers in alternative creation stories should turn to philosophers of science in an attempt to justify the why and how of their beliefs to outsiders. Generally, I have to wonder if their use selective, or if they rigorously and thoroughly apply Kuhn and Popper’s theories to both their own ideas and those of mainstream science? In other words, are they simply trying to “bring down” mainstream science, or are they using these theories to bring rigor to their own approaches? From my reading, their use does appear selective, and does appear to simply be focused on reducing mainstream science to their level (please correct me if I am wrong). Intelligent Design appears to me to be a “negative” research program, not a positive one. In other words, it defines itself in opposition to mainstream theories of evolution instead of presenting its own, falsifiable theories to explain the evidence. Noting this, Francis Collins points out that evolutionary biology makes predictions, which then work (or don’t). As far as I can tell, Intelligent Design does not do this. Finally, why have Creationists decided on Popper and Kuhn (as opposed to, say, Quine or Putnam)? I can’t answer this as yet, but it’s an interesting question. Was medieval Islamic culture inhospitable to science?